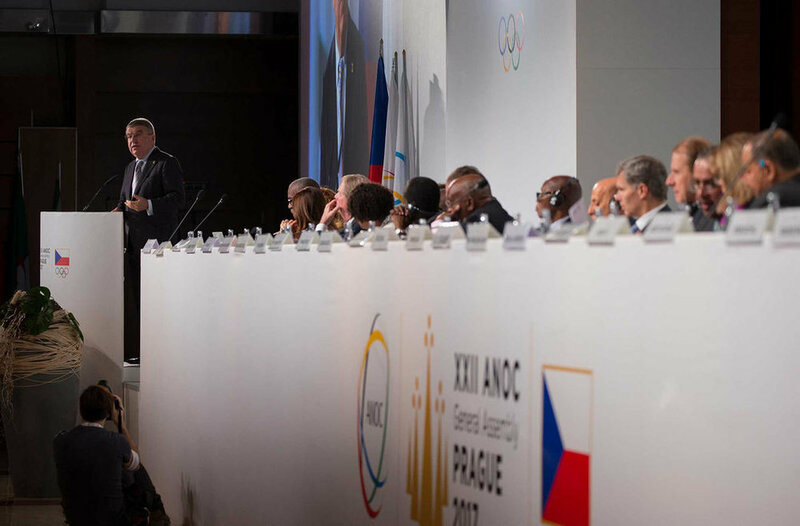 By all accounts, the Association of National Olympic Committees meeting itself — overseen by Czech Olympic officials at the Prague Hilton — was run with great efficiency. The awards gala — a fine occasion. 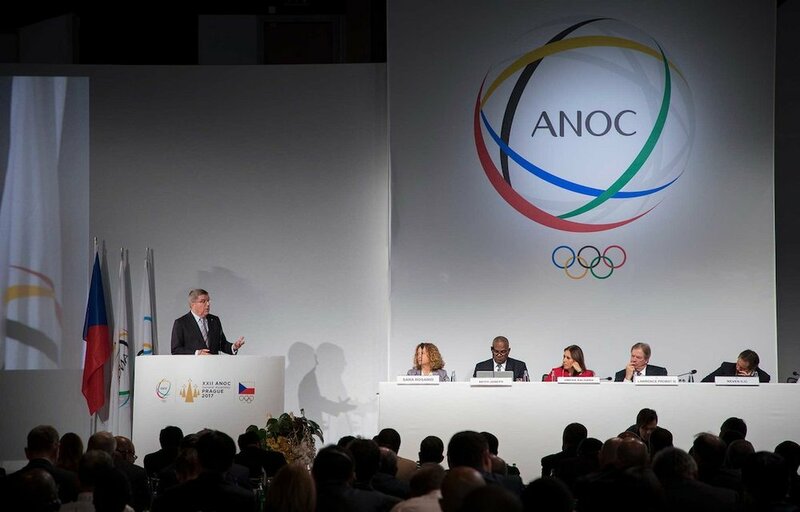 A great many people of import in the Olympic scene were on hand — including the IOC president, Thomas Bach, and ANOC boss Sheikh Ahmad al-Fahad al-Sabah of Kuwait, the sheikh back in the public spotlight after months of keeping a distinctly low profile. Put aside for a moment the show of support the assembly gave to the sheikh — who seemingly has drawn the interest of the U.S. Department of Justice in a FIFA-related matter. Forgo, if you will, the IOC announcement Tuesday that the Brazil Olympic Committee — suspended amid the arrest of Carlos Nuzman, its former president as well as head of Rio 2016 — would be reinstated for ANOC purposes. Let’s put aside Thursday’s reported appearance before a Paris judge by Namibia’s IOC member Frankie Fredericks — the authorities there investigating suspicion of far-reaching corruption amid suspicions that Rio’s winning 2016 bid was bought. Also, because no one is pressing a Games bid for anything this week, let’s move along from Sochi and $51 billion. So inconvenient on so many levels. Or allegations of Russian doping. Same, you know? “This world is more fragile than ever, and we can see in many parts of the world crises, tensions, and financial and commercial instability. Enjoying 11 years of stability with two such outstanding Olympic cities and countries is really an achievement we can build on. Every now and then, the IOC president actually — really, truly — offers genuine insight into what’s going on. Read that again: "... to enjoy stability in this world is possibly the most valuable currency in the world at this time." Bach was elected IOC president in 2013. The rules say he can be president for eight years, and then for another four. That takes us to 2025. Think of this, then, from his perspective. No matter what, the double award (read: he, Thomas Bach) has seemingly guaranteed the ongoing existence of the IOC, of the movement, of the entire Olympic franchise, to his successor — whoever he (or, perhaps, she) may be. The IOC is flush with television money, most of it American. In 2011, NBC agreed to pay $4.38 billion for rights to the Games in the United States through 2020; in 2014, just a few months into Bach’s presidency, NBC agreed to a $7.75 billion extension through 2032. Of course, the IOC has other monies as well — other broadcast contracts and sponsorship deals. But let’s be real. It’s American broadcast money that keeps this going. To pretend otherwise is folly. When you have $12 billion locked up through 2032 and your most important asset awarded until 2028, you get what you got this week in Prague — a succession of speeches from the stage. You get, and understandably — stability. As my longtime colleague Philip Hersh quipped when we were chatting this Friday morning on the phone, they could and should have had drones. When you have $12 billion locked up through 2032 and your most important asset awarded until 2028, that stability means you have opportunity directly at hand. Why not use the opportunity of getting 1300 people together for something different, more creative, more imaginative? If there’s going to be an Olympic convention — make it, you know, worthwhile? TED-style talks? On — oh, here’s one — governance best practice in real life? Another: how to identify, recruit, promote women to "Olympic family" leadership? Switching gears — how to set up a website for the dozens of NOCs that (seriously) still don’t have one, with a kicker: come to this room over here, with a few dozen eager university kids that we have recruited (they’re getting independent research credit at their local college for this project), and they will set up for you this free (no, really, free!) WordPress website for you and show you 1-2-3 easy-peasy how to run it. For those who are more technologically more advanced: breakout sessions on augmented reality? On Snapchat, Twitter, Facebook and Instagram use? Looking ahead to PyeongChang and the IOC’s sudden interest in eSports, including an announcement Friday on the official IOC website (in conjunction with worldwide corporate sponsor Intel) about a tourney in the run-up to the Winter Games — where did all this come from, where is it maybe heading and how quickly? Looking ahead to Tokyo 2020: What’s with surfing and how soon can we expect wave technology? Let’s break down skateboard tricks and terminologies? The IOC and its connected entities had better start getting its act together, and soon. To be super-obvious, $12 billion is a lot of money. Michael Phelps is (reportedly) gone from the scene. So is Usain Bolt. Those two stars have in significant measure carried the Olympics for the past 10 years. The one American winter sports star that maybe anyone can name — alpine skier Lindsey Vonn — has been hurt repeatedly in recent years. Maybe she comes back big in Korea in February. Maybe not. Figure skating is traditionally a big television draw in the United States. Anything is possible, of course, but the U.S. would not seem positioned to do well in figure skating at the 2018 Winter Games. Television ratings in Rio were down. The time-zone difference from Korea would not seem favorable for American audiences. It’s not going to be favorable for the next two Olympics, either — Tokyo two-plus years later, and then Beijing for the 2022 Winter Games. Ticket sales in PyeongChang are, to be gracious, not positive. Let’s see. An Olympics is supposed to be a celebration. Celebrations are by definition fun. Logic process for rational, reasonable would-be Olympic ticket buyer: do I want to travel halfway around the world to seek fun at a remote village that is 40 miles from a demilitarized zone and a country run by a guy who is repeatedly setting off nuclear weapons? Maybe the Koreans pull this off. But you know what? The one person who was the longtime bridge between that country and the IOC is not in charge even though he twice was, once during the bid and then again during the organizing committee stage: Korean Air chairman Yang Ho Cho (disclosure: the airline advertises on this website). An opportunity missed, big time. If the 2018 Games prove a blah nothing burger, how does that enhance the IOC’s efforts to recruit for 2026? Innsbruck already said no. Sion, in Switzerland? How do they get past a referendum there? When voters in Davos have said no to both 2022 and 2026? Stockholm said no for 2022; the likelihood of an about-face for 2026? If you think Sapporo is going to go for 2026 after the budget-busting exercise of Tokyo for 2020, I have an excellent plate of $37 sushi — one piece, my friend — right here for you. Calgary? Issues. Salt Lake City? Four years too soon. This list of what Bach called “all our challenges” is by no means exhaustive. You can maybe, however, understand why — looking at it from his point of view — he would be so keen to pursue stability. In this life, we all have only two things: time and money. With $12 billion as its foundation, the IOC has bought itself, as Bach said in Prague, some time. Even so, it’s a long 11 years until Los Angeles and 2028. The IOC is going to face considerable struggle getting to LA, and by no means is LA going to be anything near perfect — though it is assuredly the Olympic movement’s best bet in the next years, just as it was in 1984 and, before that, 1932. A suggestion: fewer drone-fests, more drones. More thinking out of the box. More creativity and imagination. More, you know inspiration — that’s what this whole thing is supposed to be about, right?